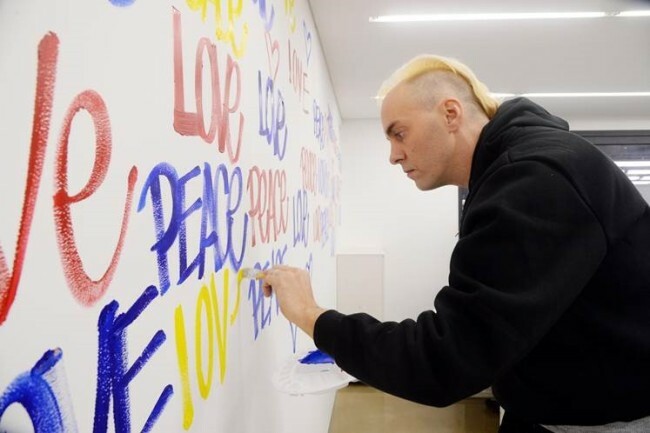 Chris Riggs, a New York-based artist famous for creating the art toy “Dunny,” paints a mural on the wall of Herald Design Forum headquarters in Herald Square in Seoul on Nov. 27. Riggs creates art mostly with a single theme -- love and peace. He gave a lecture on art toys at the Herald Design Forum 2014 at Dongdaemun Design Plaza in Seoul on Nov. 26. The theme of the mural is also love and peace.